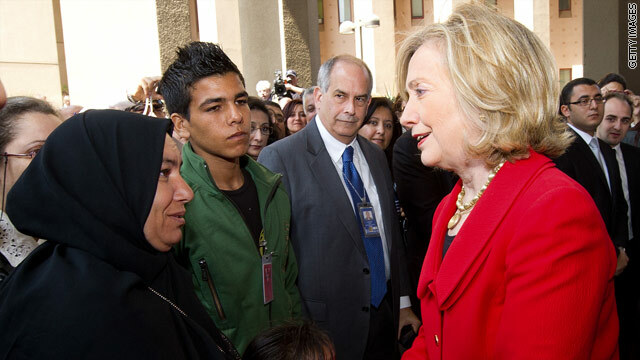 Secretary of State Hillary Clinton during her visit to the U.S. Embassy in Cairo on March 16, 2011. (CNN) - Secretary of State Hillary Clinton told CNN's Wolf Blitzer she does not want to serve a second term as secretary of state or run for president of the United States. Blitzer sat down with the former 2008 presidential candidate in Cairo. Because I have the best job I could ever have. This is a moment in history where it is almost hard to catch your breath. There are both the tragedies and disasters that we have seen from Haiti to Japan and there are the extraordinary opportunities and challenges that we see right here in Egypt and in the rest of the region. So I want to be part of helping to represent the United States at this critical moment in time, to do everything I can in support of the president and our government and the people of our country to stand for our values and our ideals, to stand up for our security, which has to remain first and foremost in my mind and to advance America's interests. And there isn't anything that I can imagine doing after this that would be as demanding, as challenging or rewarding. Q- President of the United States? You know, I had a wonderful experience running and I am very proud of the support I had and very grateful for the opportunity, but I'm going to be, you know, moving on. Q- I asked my viewers and followers on Twitter to send questions and a lot of them said, "Ask her if she'll run in 2016 for the presidency." A lot of folks would like to you to do that. Well that's very kind, but I am doing what I want to do right now and I have no intention or any idea even of running again. I'm going to do the best I can at this job for the next two years. Watch the full interview on CNN's "The Situation Room" at 5 p.m. ET. I really wish would she would stay. America needs more women like Ms. Clinton. We need smart ladies in Washington DC, and to lose her will hurt. She is truly an inspiration to young women today. Talk about a resume! Talk about accomplished! But... I could see wanting to get out of there too .Considering all of the knuckleheads in office now, I could see why she would run away. We are so grateful to you Hillary for all of your hard work! God Bless you. I hope you decide to run in '16, if you do we will be here for you. If not, it is our loss, as it was in 08. God Bless and thank you. Hillary looks a little bit tired, but who wouldn't at her job. I think Obama was very fast in doing his job trying to pull this country out of sh!t, but now I think he is more calm, its good, you cant save the world Mr. President its important to do not forget to breath while doing your job. She is a great woman who has done a great job for our country. If you don't agree you probably voted for Bush so I don't really care what you think. Good for you Hillary! You have been a good Sec of State and I think you would have been Head and Shoulder better at President than your Boss, but it wasn't to be (mostly because of 20 somethings that have lived off their Mommy & Daddies, never paid Taxes and lived in a Dream world). I can only say that I hope those Obama voters have seen the error of their ways....... doubt it, they don't look at issues or qualification.....only if they think your cool. Good riddance! Is John Kerry available? "This is a moment in History where you can hardly catch your breath"
No Kidding? what an understatement!!! I do not think that any other Administration in recent history has had so much to do in terms of crisis management. There has been crisis after crisis domestically and internationally and I am sure that although Hillary Clinton is doing a great job for her country it must be very stressful to be Secretary of State at this time. She is thinking that the stress of being the President of the United States must be a thousand times greater and "no thanks" She has proven herself and no matter what happens in the future and I am sure that she will follow in the foot steps of her husband. They had both redeemed themselves admirably and will both go down in histor as great Americans. Obama got Hillary out of the country for FOUR YEARS! No one is happier than Bill Clinton! Now while she's taking care of business abroad, Bill can finally take care of business at home! As much as I would hate to see her become President, I would love to see her beat Obama for the nomination. NWOz goons out of government and our country! One of the best things that can happen in America is for all those old 60's liberals to get old. They have made a mockery of US exceptional ism and I for one am tired of apologizing for all the great things this country has brought to the world. I hear she plans on taking a position at IHOP. After four years working for Pres. Obama, she's an expert with waffles. Good riddance. To think that I wanted to vote for this slime for president. Only to discover years later how she's at the very least, a disconnected elitist. Um....Madame Secretary, you only have 674 days left in this misadministration which is less than two years. A technicality yes, but for many of us it is worth pointing out that more days have passed under this misadministration than remain to be survived.